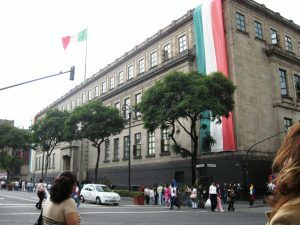 10/05/16 (written by kheinle) — A report released in late August by the Hoover Institution at Stanford University provides an in depth look at security strategies in Mexico, an important contribution to the ongoing conversation about a country embroiled in crime and violence for years. In “Security Strategies: Experiences Of The Mexican States Of Chihuahua And Nuevo León,” co-authors Arturo Ramírez Verdugo and Reyes Ruiz González found that the state and local policies implemented in Mexico to combat insecurity related to drug trafficking organizations (DTO) have been more effective than efforts taken at the national level. The report focuses on case studies in Chihuahua and Nuevo León, two states on the U.S.-Mexico border that have been hotspots for drug trafficking, crime, and violence. Chihuahua and Nuevo León have had some of the highest levels of ejecuciones, homicides related to organized crime, since 2007 when former President Felipe Calderón (2006-2012) launched the nationwide campaign against drug trafficking and related violence. The Hoover Institute report examines both states’ administrative policies implemented to reduce levels of violence, which resulted in clear decreases in Chihuahua’s and Nuevo León’s homicide rates, kidnapping rates, and the number of vehicle thefts from their peak in 2010-2011. Overall, the public’s perception of state insecurity, and the absolute number of victims and crimes in both states declined between 2010 and 2014. Specifically in Chihuahua, for example, homicide rates per 100,000 inhabitants declined from 111 to 30 between 2010 to 2014, and from 7 to 0 inhabitants per 100,000 for kidnapping rates between 2009 and 2014. Similarly, Nuevo León saw homicide rates peak at 42 per 100,000 in 2011 and decline quickly to 10 per 100,000 in 2014, though the state’s kidnapping rates did not begin declining until 2012, decreasing from 1.25 to 0.80 by 2014. Extortion rates also declined in Chihuahua, although they increased steadily in Nuevo León from 1 per 100,000 inhabitants in 2008 to 8 per 100,000 in 2014. That said, the cifra negra (black number, or the number of unreported or uninvestigated crimes) decreased in Nuevo León during this time period, but increased in Chihuahua, an interesting finding considering that state’s otherwise positive strides in other areas. 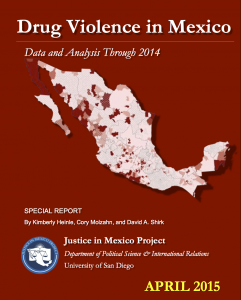 The authors drew from Justice in Mexico’s research as a primary source of information, specifically from “Drug Violence in Mexico: Data and Analysis Through 2014” released in April 2015. That publication is part of a series Justice in Mexico releases annually that compiles and analyzes the latest available data on crime and violence in Mexico as it relates to organized crime. The Drug Violence in Mexico series seek to inform a U.S. and English language audience, as international news media coverage of Mexico tends to be fleeting and gravitates toward sporadic sensationalistic incidents rather than the analysis of broader issues and longer-term trends. Justice in Mexico’s latest such report can be found here. The Hoover Institute also relied on data from Mexico’s Executive Secretariat of the National System of Public Security (Secretariado Ejecutivo del Sistema Nacional de Seguridad Pública, SESNSP), the National Institute of Statistics and Geography (Instituto Nacional de Estadística y Geografía, INEGI), the National Population Council (Consejo Nacional de Población, CONAPO), and the National Survey of Victimization and Perception about Public Security (Encuesa Nacional de Victimización y Percepción sobre Seguridad Pública, ENVIPE), among others. In the end, Ramírez Verdugo and Ruiz González found that strategies were most effective when several factors are incorporated into security strategies. First, “the state’s actions have a multiplicative effect when the civil society is involved.” Second, local law enforcement institutions must be strengthened, while, third, new procedural common law must be reformed. Next, convicted criminals must be better reinserted into society so to address recidivism and repeat offenders. Lastly, “strategies require a true commitment to fiscal discipline from [Mexican] states to make [them] viable and sustainable.” As Ramírez Verdugo and Ruiz González argue, Chihuahua and Nuevo León demonstrate that the rule of law can be improved when following strategies that prioritize and incorporate these factors. Heinle, Kimberly et al. “Drug Violence in Mexico: Data and Analysis Through 2014.” Justice in Mexico. April 2015. Hoover Institution. 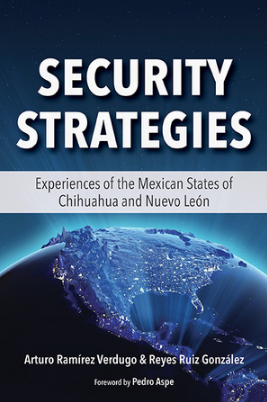 “Security Strategies: Experiences Of The Mexican States Of Chihuahua And Nuevo León.” Stanford University. August 24, 2016. Ramírez Verdugo, Arturo and Reyes Ruiz González. “Security Strategies: Experiences Of The Mexican States Of Chihuahua And Nuevo León.” Hoover Institution. August 2016. 02/14/16 (written by kheinle) – Homicide rates in Mexico rose in 2015 for the first time since 2011, according to Mexico’s Secretary of the Interior (Secretaría de Gobernación, SEGOB). The number of homicides nationwide increased from 17,324 in 2014 to 18,650 in 2015, a 7.6% jump. Alejandro Hope, former Mexican intelligence officer, commented at a “Mexico Security Review 2016” conference at the Woodrow Wilson Center’s Mexican Institute in Washington, D.C. that, “At the current rate, there will be more homicides under [current President Enrique] Peña Nieto than under [previous President Felipe] Calderón.” Despite the rise in homicides, however, SEGOB’s data reflects a 29.0% decrease in kidnappings, dropping from 1,840 in 2014 to 1,306 in 2015, and a 14.5% reduction in cases of extortion, from 6,155 cases in 2014 to 5,262 in 2015, both positive news for the Peña Nieto administration, as it conti­nues to battle crime and violence in Mexico. While crime rates varied in 2015, one constant was the public’s perception of security. According to Mexico’s National Institute for Statistics and Geography’s (Instituto Nacional de Estadística y Geografía, INEGI) annual report on public security, “Encuesta Nacional de Seguridad Pública Urbana (ENSU),” the percentage of Mexican’s 18 and older surveyed who felt safe living in their respective city was 32.3% in December 2015, barely up from 32.1% in December 2014 and 32.0% in December 2013. In fact, between September 2013 and December 2015, the public’s perception of security varied only 5.4%, oscillating between 27.6% and 33.0%. That still means, however, that at the end of 2015, 67.7% of Mexican felt unsafe living in their city. The public’s perception of insecurity in Mexico is not surprising considering the rising rates of homicide, the declining optimism that security will improve, and, among other factors, the public’s lack of confidence in police. According to ENSU results, at the end of 2015, 32.7% of Mexicans believe the Municipal Police (Policía Preventiva Municipal) are “very or somewhat effective” in their ability to combat crime, while 39.5% and 55.7% think that of State Police (Policía Estatal) and Federal Police (Policía Federal), respectively. The public expressed the most satisfaction with the National Gendarmerie (Gendarmería Nacional), rising from 61.9% saying the Gendarmerie is “very or somewhat effective” in March 2015 to 69.2% in December 2015. The Gendarmerie is an elite force of specially trained police that President Peña Nieto pledged when launching the units in August 2014 would “contribute to the protection of Mexicans, their goods and sources of employment when these are being threatened by crime.” The force has received mixed reviews since its launch. Dibble, Sandra. “New gendarmerie in Baja California.” San Diego Union-Tribune. September 5, 2014. Centro Nacional de Informe. “Informe de víctimas de homicidio, secuestro y extorsión 2014.” Secretaría de Gobernación. June 19, 2015. Press Release No. 9/16. “Encuesta Nacional de Seguridad Pública Urbana (Dic-2015).” Instituto Nacional de Estadística y Geografía. January 11, 2016. Centro Nacional de Informe. “Informe de víctimas de homicidio, secuestro y extorsión 2015.” Secretaría de Gobernación. January 20, 2016. Mexico Institute. “Mexico’s Security Review 2016: Assessing the Outlook for the Rule of Law.” Conference. Woodrow Wilson Center. January 21, 2016. Planas Roque. “Murder Rate Climbs in Mexico, Even As The Government Celebrates El Chapo’s Recapture.” Huffington Post. January 21, 2016. “INEGI: Encuesta Nacional de Seguridad Pública Urbana (ENSU).” Consulta Mitofsky. Año XIII, No. 609. February 2016.